Alilaguna water buses run from Marco Polo Airport to Venice's historic center, the island of Murano, the Lido di Venezia, and the Marittima cruise terminals. Need a convenient place to stay? See hotels near Alilaguna stops. ABOVE: Passengers board an Alilaguna water bus at Venice Marco Polo Airport. Henry James wrote that Venice was best approached by sea. That's still a good rule to follow, even in the airline era--and thanks to the Alilaguna motoscafi from Venice's Marco Polo International Airport, you can heed the novelist's advice for the cost of a local boat ticket. with stops at Murano Colonna, Fondamente Nove, Ospedale, Bacini, Certosa, Lido S.M.E., Arsenale, San Zaccaria, San Marco Giardinetti, Zattere, and Giudecca Stucky before reaching the Marittima cruise terminals. a seasonal route with stops at Murano Museo, Certosa, Lido S.M.E., and San Marco Giardinetti on its way to Giudecca Zitelle. This line normally operates from early April until early November. Tip: If all of the above seems confusing, just go to the Alilaguna ticket booth, show the location of your hotel on a map, and let the ticket clerk decide which boat you need to catch. Adult one-way fares range from 8 to 15 euros, depending on distance, with a reduction for roundtrips on some routes. "Time tickets" (24 or 72 hours) are also available. You'll pay an extra euro if you buy your ticket on board, and you can save a euro or two by booking online. The fare includes transportation of one suitcase and one piece of hand luggage. Extra bags cost 3 euros each. If you have a VeneziaUnica (formerly iMob) stored-value card for residents and long-term visitors, show it when buying your ticket for a 50 percent "Cartavenezia" discount. 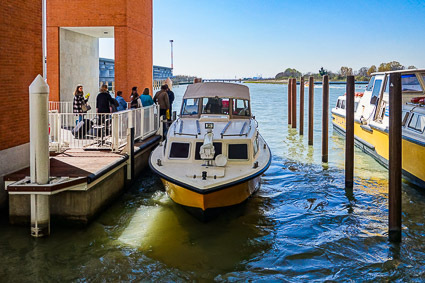 Some versions of the VeneziaUnica tourist pass (formerly VeniceConnected) include Alilaguna airport transportation, but you may find it simpler just to buy a boat ticket. Alilaguna is a separate company from ACTV, the transit authority that runs Venice's public water and land buses. ACTV's Tourist Travel Cards do not cover transportation on Alilaguna airport boats. For up-to-date airport-boat timetables, fares, and a route map, click the Alilaguna link below. Note: If Alilaguna doesn't stop near your hotel and you aren't on a tight budget, see Viator's Venice Transfers & Ground Transport page for information on shared and private water taxis. 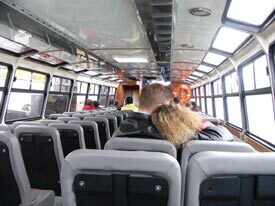 ABOVE: A couple enjoys a snuggle during the Alilaguna boat ride to Marco Polo Airport. Normally, you buy your tickets at the Alilaguna booth by the pier. (The public-transportation counter in the arrivals terminal also sells Alilaguna tickets.) If the ticket booth is closed, or if there's a line, use the 24/7 ticket machines. Remember to validate your ticket before boarding the boat. For more information, see Alilaguna's conditons of carriage. When you board the boat, the conductor will take suitcases and stow them for you. At the end of the ride, get off the boat and wait for the Alilaguna staff to unload suitcases onto the pier. Check the airport boat's site for current timetables, fares, a route map, and other information. 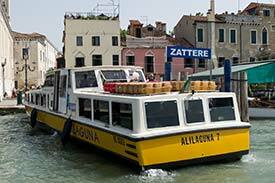 ABOVE: An Alilaguna Linea Blu airport boat arrives at the Zattere stop on Venice's Giudecca Canal. Our guide has dedicated pages with maps, photos, and other information for 76 waterbus stations in Venice and the Venetian Lagoon--including the Alilaguna and water-taxi piers at Marco Polo Airport. With this page from our Venice Hotel Directions guide, you can find hotels (with maps and walking directions) for any Alilaguna airport-boat route and stop. VCE has a large, modern terminal building and flights to cities on four continents. Best of all, it's just 6 km (4 km) from Venice's historic center by boat, taxi, or bus. Our step-by-step directions for arriving airline passengers include photos and useful tips. If you decide against the boat, here's how to take the ACTV city bus or ATVO airport bus to the Piazzale Roma. Tips on reaching the city center from the railroad station and mainland highways, together with abridged information on the airport boat.